MEATPACKING DISTRICT — It's the cobblestones that keep 'em coming back. Drawn by a love for truffle-infused dumplings, the fashion world's brightest and the neighborhood's characteristic cobblestone streets, Meatpacking District denizens enjoyed some of the neighborhood's finest food and cocktails at a stylish benefit event for the upscale area Monday night co-hosted by designer Diane von Furstenberg. The legendary local designer, calling herself the "godmother of the neighborhood," predicted a bright future for the area and said the Meatpacking District offers something for everyone. "It's all there," she said. "It's a real neighborhood — with cobblestones." As house music spun by J.D. Samson played inside two floors of Highline Stages, the well-dressed crowd sampled offerings from 16 local restaurants, with food including soy-cured salmon with creme fraiche, pear and lime from Spice Market and edamame dumplings with truffle oil from Buddakan. In booths designed using wooden pallets, shoppers checked out deeply discounted items from labels including Theory, DVF, Tory Burch and Helmut Lang. Paul E. Pariser, president of the Meatpacking District Improvement Association — which hosted the first annual Open Market event — said the festivities showed off all the area has to offer, particularly to shoppers. "The Meatpacking District is such an incredibly vibrant spot with so much potential. Our idea was it put it all in one spot and let people realize what a great area this is," he said. "Tonight is a night that shows off the future of the neighborhood, especially in fashion." Art advisor Chrissy Crawford, a Soho House member, said the addition of the Whitney Museum of American Art, scheduled to open in 2015, would make the area even more culturally rich. "For now we have great retail and great nightlife," she said. 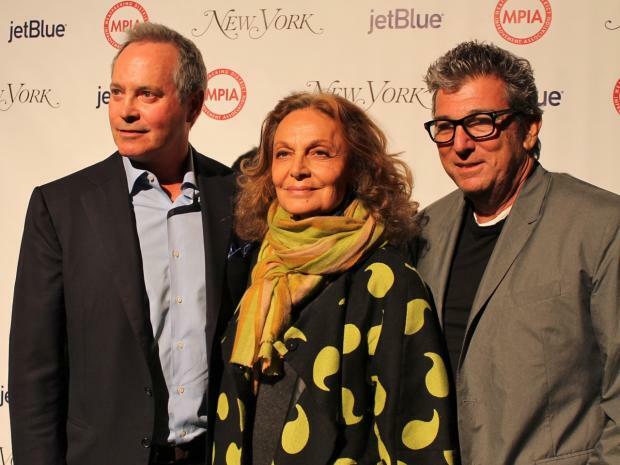 "We're very excited for the Whitney to come. It will bring a new demographic to the area."